Because altitude affects so many facets of climate, high-altitude homesteading presents unique challenges. The exact bounds of “high-elevation” are often disputed — the University of Idaho Cooperative Extension guide starts at 4,500 feet above sea level, whereas the Colorado State University Cooperative Extension considers high elevation to be 7,500 feet and above — but life certainly starts changing once you start homesteading at mountainous heights. According to the Colorado State University Cooperative Extension, the temperature drops by an average of 3.5 degrees fahrenheit for every 1,000 feet of elevation gain. The air at high altitudes is also drier and contains less oxygen. Healthy backyard livestock can usually adapt to the changes in altitude, but Ragan Adams, veterinary extension specialist at the Colorado State University Extension, recommends buying animals from the area where you plan to homestead that are adapted to the elevation. “If you buy animals from altitudes that you are living at, they are probably already adjusted,” Adams says. If you are moving from a lower altitude, Adams says your animals may experience drier respiratory tracts and require a little extra hydration, but as long as you are not homesteading at altitudes over 8,000 feet (the same elevation that humans begin experiencing acute altitude sickness due to the low levels of oxygen), she says most animals will probably adjust within a week. Because the weather can be variable at higher altitudes, it is also smart to choose hardier livestock that can withstand cold temperatures. Ducks, for example, are usually cold-hardier than chickens. The same applies to plants. The main concern at high altitudes is the truncated growing season, with a shorter amount of time between frosts, so choose vegetables with the shortest “days-to-maturity” numbers for your high-elevation garden. Leafy greens like spinach, lettuce, arugula and chard as well as root vegetables like carrots, turnips, parsnips, radishes and beets are the best choices. Some of McDorman’s short-season favorites from his decades of high-altitude gardening experience are the De Cicco broccoli, Kinko carrot, Dwarf Siberian kale and Ithaca Head lettuce. Vegetables like tomatoes, squash, peppers and green beans require more time to grow, but experienced gardeners might be up to the challenge. (McDorman recommends the Stupice tomato, which matures in about 50 days). Checking the growing zone for your area through the U.S. Department of Agriculture will help determine what plants thrive in part of the mountains. Most of these vegetables can be given a jump by starting seeds indoors and transplanting them to the garden during the growing season after the frost has passed. You can use a season extender like a greenhouse or cold frame to expand the options you have for growing. The soil in mountainous areas also often requires significant amendments before it is arable. 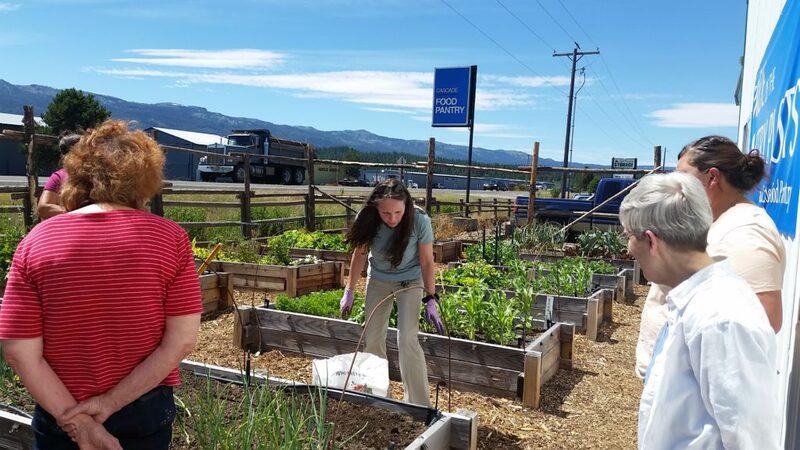 According to the Colorado State University Extension, mountain soils only have about 1 percent organic material, when 5 percent is preferred for to promote drainage and feed soil microorganisms. Your local cooperative extension can help test your and recommended potential solutions. “Knowing what soil you’re working with whatever you are is really important,” Hamilton says. For rocky soils, Hamilton recommends using raised bed with a topsoil and compost mixture. The location of your garden on your property is extra important at high elevations. Factors like the slope of the land and the proximity to buildings can impact the amount of sunlight and warmth your plants get. McDorman says to slightly slope your garden soil towards the south — even one or two degrees can make a huge difference in how much heat the soil takes in during the day and radiates out at night — and to grow your garden close to your house. One of best ways to have a successful high-altitude garden is to source your seeds locally. Coffey recommends researching a seed company in your area and getting connected to your local seed community to find seeds that are better adapted to your elevation. After multiple seasons, you can even collect your own from your garden. “If folks in higher elevations find something that works that they really like, find a way to extend the season so you can save your own seeds and adapt them to where you are,” McDorman adds. Coffey recommends planting extra to account for inevitable nibbling, planting a perimeter of prickly plants to deter deer or building a solid fence that deer will have difficulty jumping over. High-altitude homesteading in general is about knowing the microclimate of your property. Use a garden journal to record the frost, night-time temperatures and your general observations to figure out the patterns of your land to gain a better understanding of its particular altitudinous whims. Interesting article here about farming and living off the land at higher altitudes. For those who are new to the idea and climate, don’t let the cooler temperatures trick you into thinking the sun isn’t a threat to your personal health. Because there’s less atmosphere to filter and weaken UV rays, solar radiation is 8-10% stronger for every 1,000 feet of extra elevation. Cover up your skin, and stay hydrated to stay safe and healthy at altitude. That is an interesting factoid to add to this discussion about homesteading at high-altitudes, Blaine! I’m sure our readers will appreciate the tip.